It’s fresh. It’s healthy. It’s delicious. It must be Etai’s Catering. Welcome to our blog, where we will teach you everything you need to know about our Denver catering services and why we have been the area’s top choice for fresh and local catering for events of all types. What makes our catering services so special? It’s quite simple, really. We cater our services to you and your event, crafting the precise delicious trays, box lunches, sandwiches, salads, and desserts that you want — whether it’s a corporate breakfast, a business lunch, or your mother’s 50th birthday celebration. We use fresh ingredients, bake many of our items right here in Denver at our state-of-the-art artisan bakery, and always pay attention to your special requests and needs. Our aim is to help you create a memorable event with remarkable local catering services that will leave your guests far from hungry. Keep reading to learn more about Etai’s Catering and place your order online today to get high-quality Denver catering services for your next event! Etai’s Catering was founded in 1994, when Udi Baron and his wife, Fern, decided to get into the food service business. What drove them to this new frontier was their passion to curb people’s hunger, and their revelation that everyone loves delicious food — so why not make some? Since 1994, Udi and Fern’s vision has blossomed into six family owned and operated businesses, including cafes, artisan bakeries, full-service restaurants, and of course, Etai’s Catering. We are passionate about providing the best Denver catering services suitable for any event, large or small. From the food that we create at our in-house kitchens, all the way down to the customer service and attention we provide, you can rest assured that no detail goes overlooked. Etai’s provides top-notch Denver catering services using fresh, delicious ingredients in order to create a memorable meal. No matter what type of event you are having catered — whether a business breakfast, meet-and-greet, or even a wedding reception — the one thing you don’t want is to have guests that are hungry. We make your job easier by taking care of all of the cooking and food prep, allowing you and your guests to sit back and relax. Nutrition and nourishment are important for all types of events, because these are the times where we are always on-the-go and sometimes forget about taking care of ourselves. Breakfast: Have an early morning event? Get your day off to the right start with our Denver breakfast catering services. Choose from freshly baked goods to breakfast burritos made with our homemade salsa. Box Lunches: Convenient? Check. Selection? Check. Delicious and affordable? Check and check. Our box lunch options are great for on-the-go events, conferences, and meetings. Choose from a wide offering of deli sandwiches, sides, and more. Salads: Looking to add a healthier option to your spread? Don’t turn green just yet. Take a look at our hand-tossed salads, packed with micro and macro nutrients that are low in calories and high in deliciousness. Choose from assorted salads like our Southwestern Grilled Chicken Salad, Mixed Avocado Salad, or Etai’s personal favorite — the Blueberry Kale Salad. Lunch Platters: Etai’s specializes in creating hand-crafted lunch platters and trays. From sandwiches (featuring our legendary Izzio breads) to delicious cheese, veggie, fruit, and hummus options, we do it all. Dessert: Now we’re talking. What event could ever be complete without the sweet goodies to top it all off? Etai’s Catering bakes many of our own delicious desserts in house, including our delicious cookies. We also have gluten-free options and classic dessert trays available for any event. Etai’s Catering provides high-quality, fresh Denver catering services to any type of event. From wedding receptions to corporate lunches, breakfast meetings to birthday parties, our team is well-equipped to provide special events catering throughout the metro and front range areas. It’s simple, really — you have an event, we have the catering services. Allow us to join forces and conquer hunger once and for all! 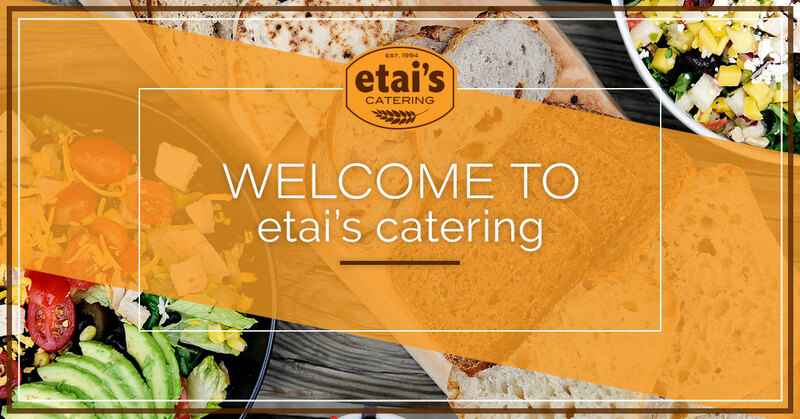 Order catering online today from Etai’s, or contact us with any questions or special requests.